Cow's or goat's milk – one of the first products with which a person meets after breast milk. To use animal milk or soy people throughout life. And to drink yield maximum health benefits, you need to know which product has more benefits – goat's or cow's milk. Worldwide, goat milk is considered the most useful. Because of its low allergenicity and good digestibility of milk given by goats, it is recommended for baby food. If you believe the legends and myths of Ancient Greece, Zeus the Thunderer himself was nourished with goat's milk. And if you compare cow's milk with goat on the content of valuable substances, it becomes clear why the latter is more popular. Any milk contains valuable vitamins, minerals, however, the product given by the goats, calcium, vitamin A, protein and more. And there is less cholesterol, though the caloric content below is from cow's milk. It is proved that the fat of goat milk is better digested, it is digested more quickly and can be used for diet, baby food. The digestibility of goat milk due to lack of agglutinins, causing the fat globules in the product do not stick together. When injected into the stomach proteins product form a soft clots which milk does not irritate. Goat milk can be consumed with pancreatitis, ulcer disease, diseases of the biliary tract. This dairy product is recommended for bronchial asthma, liver disease, colitis, migraines, acute inflammation, depression. The therapeutic properties of the milk of goats explains the use of animals of plants with astringent effect. Drink can even stop bleeding. Goat milk has more fat – about 10 grams per Cup in cow's same – 8-9 g. you Need to remember that it is much easier to buy low-fat or skim cow's milk, goat is traditionally diluted with water. In cow's milk a little more lactose is 4.7 % and in goats, this parameter is 4.1 %. Therefore, the milk of the goat can be used by people with mild lactose intolerance. Most often, goat's milk is recommended to drink for those who are allergic to cow's milk. But the full hypoallergenic product, which is given the goats can not speak. Found that in goat milk compared with cow's four times more copper, 134% potassium. And even in the milk of goats is more folic acid – 10 times, five times higher content of vitamin b-12. The uniqueness of goat milk is that this product has a milder taste than cow's. Fresh goat milk will stay fresh longer due to its antibacterial properties, milch animals are immune to tuberculosis, so their milk is used for the treatment of this disease due to the antibodies. People have long known that goat milk is very nutritious and good for health. Contained in the fine goat milk fat is easily digested and lactose content in it is less than in cow's milk. Therefore, goat milk is suitable for people who react badly to lactose. In the milk of the goat contains a large number of biologically active substances, and protein and fat globules smaller, therefore, for baby food, goat milk is even more acceptable than cow's. Goat milk contains many vitamins and minerals. Cow's milk, of course, very useful, but goat the concentration of nutrients is much higher. Rich in calcium and phosphorus of goat milk is very useful for the formation of bones, hair and nails in children, as well as for metabolism and normal functioning of the nervous system. Is rich milk and vitamins C, D, And b vitamins, essential to a child's growing body. Useful of goat milk is also due to the high content of potassium, which is necessary for normal activity of the cardiovascular system. However, goat milk can not replace breast milk women, as it has a quite different proteins. 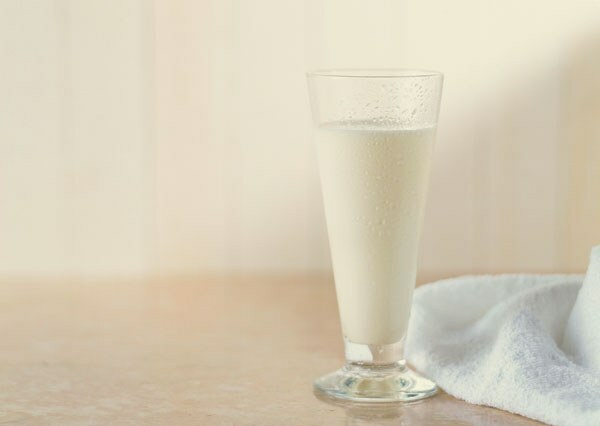 Women's milk refers to the albumin protein products, and goat – casein, and cow. But when artificial feeding baby goat's milk is very useful as it is a great vitamin Supplement for the baby. Besides the milk of the goat contains almost no lactose that babies are often allergic to. Experts believe that giving goat milk child can be 3 months. The milk should be fresh, and feeding the baby it is diluted in a ratio of 1:1 with warm boiled water. The daily rate of goat milk for infants – not more than 50 g, for children older than years – 100 g, and children from 12 years and adults should not drink more than a glass of goat milk a day. Goat milk is stored for long, as it very quickly microbes evolve. Even boiled goat's milk turns sour much faster than cow. So before giving goat milk child, make sure that it is fresh and contains no additives. The best milk for infant feeding is breast milk. However, for various reasons, the mother may not have milk, feed the baby need. This files most often as a substitute for breast milk use the milk from the cow. Is it possible to give the child goat's milk? Often kids with an Allergy to cow milk protein tolerate milk from goats. However, be aware that infants goat's milk should be diluted. Strain fresh milk through gauze. Pour it in a pan with the addition of water. Dilute the milk in the ratio 1:1 with water for young children. Dilute goat's milk is necessary because it is more concentrated on mineral substances in comparison with women's milk. Start giving milk by teaspoonful. If skin reactions will not be the child normally acquires milk, can gradually increase the portions. Put the saucepan on heat and bring to a boil. Cool the milk at room temperature. Small children can only drink boiled milk. Older children and adults healthier to drink whole milk. When buying store-bought milk carefully check the date of production and shelf life of the product. People with certain types of diseases, it is advisable to eat goat's milk, however, it is also recommended and those who are healthy. This product is amazingly rich in nutrients, and therefore is applied when artificial rearing of children. However, goat's milk is very fatty, you need to dilute it. 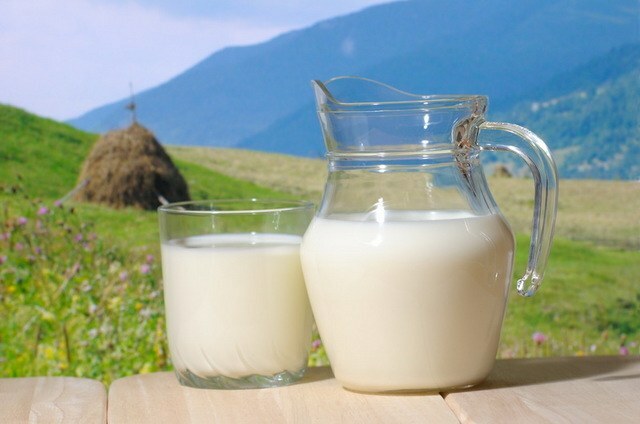 Goat's milk, considered a cure for many ills: strengthens the immune system, regulates hormones in the body and so on. Compared to cow's milk, goat's closer to human milk and contains even more mineral substances. Therefore, in order not to burden the child's body extra minerals, to exclude the possibility of allergic reactions patients and weak people, it is recommended that before use, dilute the goat milk. If you use goat's milk as complementary foods to a baby, then listen to the advice of experts who recommend to bring it the consistency of salt to breast milk. To do this, mix in a clean container with four parts water and one part milk. It used for baby food and dietary goat milk has also bred other way. Pour into the container of three parts warm boiled water and stir, pour in one part goat. A homogeneous liquid with a blue tint. This mixture can be given not only to children but also the sick, the milk will not give a significant load on the liver and stomach. A week later, the milk concentration increase, provided that the person tolerates it. To three parts of water add two parts of milk. Dilute the goat milk is not only water, but also rice or oatmeal broth. This mixture is very useful for stomach, strengthens the immune system. Introduce such mixtures in the diet of the General rules - start with one or two tablespoons a day. You can gradually increase the amount and concentration of milk to bring to the limits: two parts milk to one part water. Each day you can subtract 5 g of water and add 5 g of milk. After a month of use take a break and do the tests on hemoglobin, some of it may fall, as in the milk of goats, low levels of folic acid, iron and other important vitamins. Goat milk enter into the diet in small doses and always diluted. Goat's milk, properly diluted, may not be the only product in the diet of crumbs. It is advisable to amend the child nutrition this "precious" product after 9 months of life. And after 12 months you can try undiluted goat's milk or cooking of porridge based on it. It is advisable to give the baby is not more than 100 g per day. Single answer question about what age to give baby fresh milk, no. It all depends initially on the quality of this fresh milk. 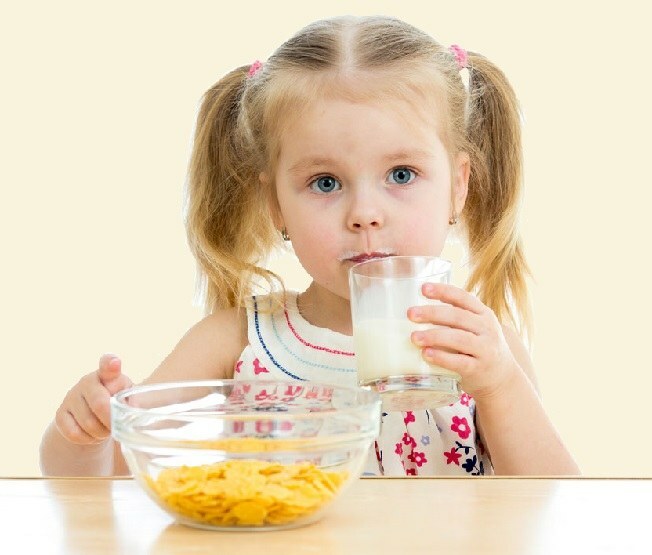 All reputable pediatricians in one voice told that fresh milk is by far the before use you need to boil. And when you boil all its useful properties, and harmful bacteria disappear. Dr. Komarovsky about fresh milk, says: "In the fresh milk contains many hormones, which can affect early sexual development in girls and delayed sexual development in boys". But all the same milk, according to Dr. Komarovsky, it is not necessary to give the child up to the age of 2 years. Yes, breast milk rich in nutrients, and chief among them calcium, but it contains such substances, for example, phosphorus, which are very poorly processed child's body, and in addition, the phosphor directly affects the absorption of calcium. Therefore, the less age your child is, the worse this steamy drink will affect the condition of his bones. 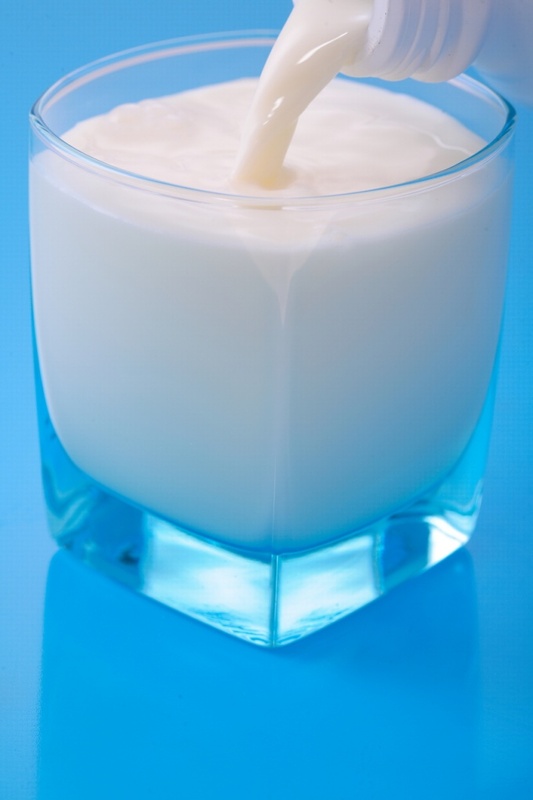 The main point in the use of milk is the quality of raw materials and the amount of alcohol consumed per day of milk. If the volume that the child drinks, not more than 200 ml, such a small dose will not adversely affect the stomach and the bones of the baby. 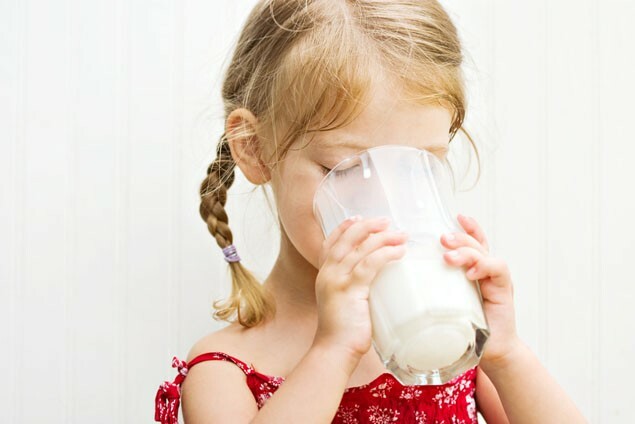 Benjamin Spock believes that a child should drink in day approximately 1 liter of milk. But it is not necessary to give to drink pure. It is possible to give the child cocoa to cook porridge with milk, to make ice cream, as processed milk in any form and at any the food is much better absorbed by children's body, because milk protein will not be present in pure form. But the pediatricians all over the world do not recommend to drink cow's milk to children under 2 years. It is best to replace it with a tailored mix of marks on the Bank 2 or 3 (from 6 months to 12, and the following for children older than 12 months). These mixes are as close to female milk, and in addition they still present all the necessary substances, vitamins and minerals which are necessary for the child at different stages of his life. Milk is useful due to the large content of calcium, sodium, magnesium, potassium, phosphorus and other substances. But there is one thing big but that can turn everything useful that is in the fresh milk into huge health problems of the child is the quality of the milk. Yes, if the cows were provided with green food, full compliance with hygiene and sterility in the cows, nobody would have given them antibiotics, etc., of milk, of course, it would be 100% useful. But unfortunately all parents, such an ideal situation in today's world is impossible to achieve. Even a domestic cow, which eats in the summer in the meadows, and in winter, hay from these fields will never give organic milk. There will in any case contain harmful bacteria, within 2 hours after milking the milk will be most useful, but if not put in cold, the amount of bacteria in it will start to increase dramatically. Of course, for the baby there is nothing better than breast milk – a natural food containing all the essential for growth and normal development components. But, unfortunately, not all moms for a number of reasons can provide your child breast milk at least until 6 months. Before the traditional alternative to breastfeeding was cow's and goat's milk, but today its benefits to the infants in question. Goat's milk has long been considered to be certainly helpful and healing in folk medicine, it is used to treat tuberculosis, anemia, to strengthen the General health. Because it is 4 times fatter than the female, it was given in diluted form to debilitated children and those who had food allergies to cow's milk. Compared with cow's, goat's milk is better digested and the proteins are more easily absorbed by the body of the child, has 13% more calcium, 25% and 47% more vitamin B6 and A, respectively. Goat's milk is superior to that obtained from the cow, and the mineral content in it is 1.5 times more potassium, 3 times Niacin, 4% of copper and 33% - selenium. Milk, which is produced from Pets, according to the nature of the proteins contained therein is separated into two groups: casein (cow, goat) and albumin (Mare's, donkey's). Female milk – albumin. Because it contains a large amount of protein with a good amino acid composition and digestibility, it is especially useful for children who are malnourished. Goat's milk is the best alternative to breast because it has almost no lactose, which is an allergen for many children, and it is digested much faster than cow and also contains all the necessary useful elements. There is, however, a number of reasons why the use of cow's milk becomes less obvious. One of the main is the need of its thermal treatment, which significantly reduces the content of vitamins, particularly folic acid, which is destroyed in full. The high temperature at which pasteurized goat's milk, it kills many beneficial enzymes. The need to dilute it because of the high fat content also significantly reduces its nutritional value. In General, pediatricians are advised to replace the whole goat's milk in toddlers diet adapted to women's breast-milk mixtures based on goat's milk, it is preferable for the delicate digestive system of the baby. Goat milk is recommended for older children – preschoolers and older. In this case, the deficit of certain substances will be compensated by diversity of other foods in the diet of the child. Studies have shown that when fed goat"s milk children aged from seven months to three years positive effect can only be achieved at a sufficiently varied diet. In this diet the consumption of goat milk should be limited to 200-400 ml per day, and the menu to complement dishes of vegetables, cereals and fruits. Advice 7 : Can a baby cow or goat milk? Not so long ago in many countries, infants under one year fed cow's or goat's milk. If the mother was not able to continue breastfeeding or to find a nurse for the baby, she gave the baby cow's milk or goat. Choice any more was not, because of arguments about whether it was appropriate to feed such milk the child had no special meaning. Infants not recommended to feed cow's or goat's milk for a number of reasons. Now there is a very wide selection of diverse children vysokotarifitsirovannyh nutrient mixtures. Manufacturers strive to make their composition the most similar to the composition of breast milk. But the composition of cow's milk is very different from the breast. First, high protein and sodium (3 times higher than in the thoracic) may have a negative impact on the health of the child, because the child's organism is still not ready to cope with such loads on the kidneys. In addition, concern for pediatricians is the low level of iron in cow's milk. If the baby is not getting enough iron, it raises the risk of developing iron deficiency anemia. Milk formulas often cause allergies in children, but cow's milk is one of the strongest allergens to the body of the baby. Goat's milk can also cause allergic reactions, but much less frequently. Another danger of feeding a child cow's milk is that the calcium contained in it, is poorly absorbed because of insufficient amounts of fatty acids, vitamins and carbohydrates. For the foregoing reasons, feed the children under three years cow's milk is not recommended. Goat's milk more suitable for babies. Its protein is easier to digest, and in composition it is a bit closer to breast milk. Unlike cow's milk, it contains folic acid. But it is better to start to feed the child goat's milk after a year. If you decide for any reason to give the baby milk cow or goat, remember that it is better to enter it in 9-12 months, starting from 50g per feeding. Pay attention to the fat content of milk, even milk with a fat content of 2% must be diluted with boiled water in proportion 1:1. It is also important what kind of milk you give your child. Mothers who lived in villages, much bolder and at an earlier age, introducing baby to cow's and goat's milk, because they believe that their cow is not sick, you know, what she eats, where grazing. We can not be sure that the milk bought in shops or markets, it's absolutely safe. It needs to be boiled before drinking, and this, unfortunately, destroys a part of useful nutrients. Pay attention to the chair of the baby and skin rash. If you have any problems, infants older than 8 months can be administered in the diet instead of milk baby milk products, milk, yogurt. In any case, the most optimal, healthy baby will be continued breastfeeding. In the second place utility are dairy dry mix, enriched with all the necessary baby vitamins and minerals.